Before installation check MD5 Checksum for integrity. Here is the software.The Software is Free. 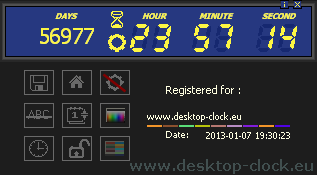 Displays current date and time [digital clock] (day, month, hour, minute, second). Counts down to the set date shows actual number of days, hours, minutes and seconds. 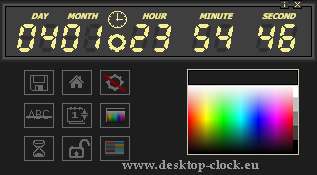 Countdown picker unlocked version allows set background display color. Countdown picker unlocked version allows set digit color. Sets the program window on top of other windows. Hides or shows display subtitles. Hides or shows program control panel. hides or shows display panel. Countdown ticker unlocked version saves current settings. Hide or show current date. Displays voice and chime indicator. is a simple Windows application that allows both to count down the time from the set date as well as to monitor the current date and time. 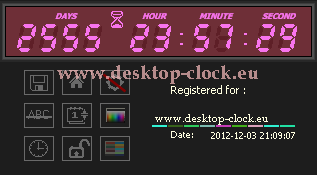 Countdown Picker window can be freely placed on the desktop. Unlocked version allows you to change the background color and set any color of digits, also allows you to save your current settings. 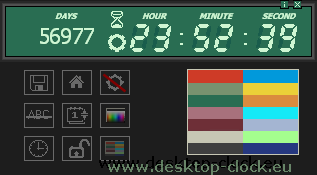 Application icon in the system tray has features to hide the main window, set the program window on top of other windows, access to program settings, close the countdown ticker. and other sites. It has INSTALL and UNINSTALL feature. 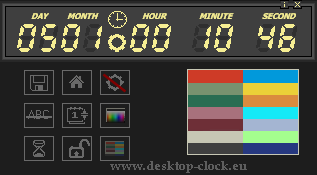 Saves current settings like: countdown date and time, current display color, current digits color, program position on the desktop, current display (clock or timer). Brings the program to default settings. Brings the ticker panel with date time settings. Brings the digits color palette. 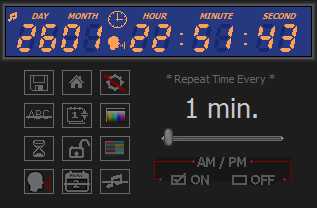 Changes display to clock with current date and time. Changes display to countdown picker. Brings the display background color palette. Brings the time voice panel settings. Shows or hide display current date.